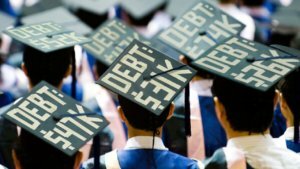 College students across the country are facing high student loan debt taken out to pay for their college expenses. Even those students who found themselves the recipients of generous financial aid packages are finding that they must take on thousands of dollars of debt to complete their studies. In fact, the ability to obtain significant amounts of financial aid during the freshman and sophomore years of college bites some of these students as grants and scholarships dry up during their final years before graduation. Many students coming from middle- and lower-income families choose to go to the college that offers them the most money in financial aid. Because grants and scholarships do not have to be paid back, like student loans, these students see the financial aid as a way to attend a more expensive college without incurring a massive amount of debt. Unfortunately, these students make the mistake of believing that they will be getting the same amount of financial aid each year that they are in college. Financial aid began to become a potent recruiting tool several decades ago. Colleges found that they could make themselves more attractive to students that may be sitting on the fence about enrolling by offering substantial financial aid to help them pay tuition. After investing so much time and effort during their first years of college, these students would be likely to do all that they could to finish their studies at that particular college. The personal costs of college can increase considerably for a student during the course of an undergraduate career, due to fewer opportunities for monetary aid, tough academic requirements for grants, and unanticipated tuition and fee increases. When students do not receive enough money in financial aid to cover their college costs during their final years of college, they often resort to student loans to be able to finish their studies and graduate. For a single year of college, this often amounts to tens of thousands of dollars in debt. There are also concerns that financially troubled colleges and universities are front-loading financial aid to entice students to enroll, then lowering or cutting the award in later years. In fact, complaints from consumers suspecting these sort of practices have caused several advocacy groups to recommend that students avoid certain colleges where scholarship cuts had been occurring frequently. The issue also caused the National Association of Student Financial Aid Administrators to update its code of conduct in 2014, expressly recommending that members clearly spell out scholarship renewal requirements. There are a number of things that a student must do to keep as much of their financial aid as possible during each year of college. They must keep up their grade point average to ensure that they remain eligible for their financial aid. They must also be aware of deadlines for filing aid forms. Students can also lose their aid if they don’t take the correct distribution of credits or don’t complete at least two-thirds of the credits they are attempting to earn. I think many folks should consider two years of community college, then transfer into a normal state college. This can save tens of thousands of dollars and will help keep debt to a minimum. You are absolutely right! In many states community college is such a bargain and you can get an associates degree. Depending on your chosen profession, an associates might be all you need to get started and then you could even get your employer to foot part of the bill for your bachelors. At the very least you’ll probably save a ton of money by choosing to start at a local community college. Hmm this seems like something worthy of a full length post.